(AP) — The Miami Heat made it back-to-back NBA championships -- and third since 2006 -- with a gritty 95-88 victory over San Antonio in Game 7 of the NBA Finals. As usual, LeBron James made it happen. The Heat superstar poured in 37 points and grabbed 12 rebounds to earn MVP honors for the second straight year. 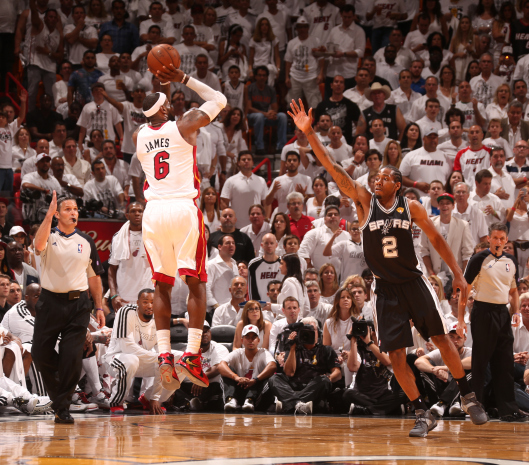 With the Heat nursing a two-point lead, James secured the victory with a 19-foot jumper with 27.9 seconds left. James would add two free throws four seconds later. James made 5 of 10 3s, all while hounding Spurs star Tony Parker on defense to make the Heat the first back-to-back champs since the L.A. Lakers in 2009-10. Dwyane (dwayn) Wade added 23 points and 10 rebounds and Shane Battier (BAT'-ee-ay) scored 18 points on 6-for-8 shooting from 3-point range for Miami. 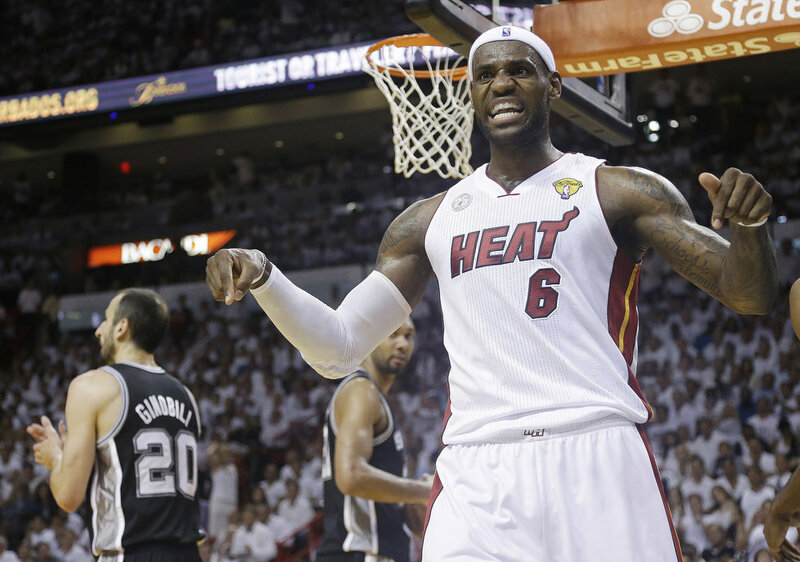 The Heat rallied from a 3-2 deficit to win the final two games at home. Tim Duncan had 24 points and 12 rebound for the Spurs, who were trying to become the first road team to win a finals Game 7 since Washington in 1978. San Antonio lost for the first time in five finals appearances. (AP) — Pinch-hitter Marcell Ozuna's two-run single gave Tom Koehler his first victory in nine career starts, and the Miami Marlins rallied past the San Francisco Giants 2-1 Thursday night. Ozuna's line drive to right field in the eighth inning off reliever Jeremy Affeldt (1-3) ended Koehler's struggles. After six appearances in the bullpen, Koehler (1-5) had been winless in seven starts this season — and took the loss in his lone start last year — for the worst team in the majors. Giants starter Chad Gaudin tossed 4 1-3 scoreless innings but left the game after taking a hard line drive off his right throwing elbow. The team said he had a bruised elbow. Joaquin Arias' RBI triple put San Francisco up 1-0 in the seventh. (AP) — Ian Kinsler put Texas ahead for the first time with a two-run single in the seventh and the Rangers held on for a series-clinching 4-3 victory over the AL West-leading Oakland Athletics on Thursday. Texas pulled within a game of the Athletics by winning three times in the four-game series. Kinsler came to the plate right after Leonys Martin's hustling infield single, getting to first base ahead of Sean Doolittle (3-2) when the pitcher was taking the toss from first baseman Brandon Moss. That loaded the bases with two outs, and Kinsler hit a full-count pitch through the middle of the infield. The game ended when Josh Donaldson was thrown out at the plate trying to score from first on Seth Smith's single to center. (AP) — The San Jose Sharks have signed forward Raffi Torres to a three-year contract that will keep him off the free-agent market next month. General manager Doug Wilson announced the signing on Thursday. Torres was eligible to become an unrestricted free agent on July 5. Bringing Torres back was a major offseason priority for Wilson despite the forward's suspension for the final six games of the second round for an illegal hit on Los Angeles' Jarret Stoll. Torres provided a spark after being acquired from Phoenix at the trade deadline and had expressed a strong desire to stay in San Jose. Torres had two goals and four assists in 11 regular season games with the Sharks and also scored an overtime goal to beat Vancouver in the first round. 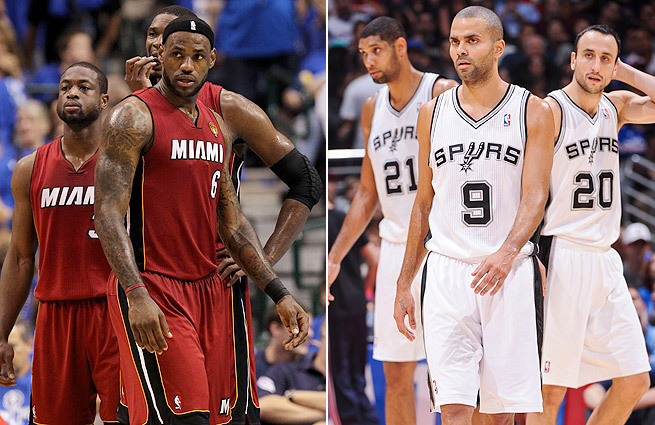 AP) — The NBA championship will be determined tonight in Miami as the Heat entertain the Spurs. It's Game 7 of the Finals and with Miami's last-second, overtime win two nights ago, the Heat and Spurs find themselves matching up one final time with the winner taking home the Larry O'Brien Trophy. To successfully defend their championship the Heat will have to do something neither team has been able to do in this series, win back-to-back games. If the Heat lose, it'll be their second Finals failure in three years. 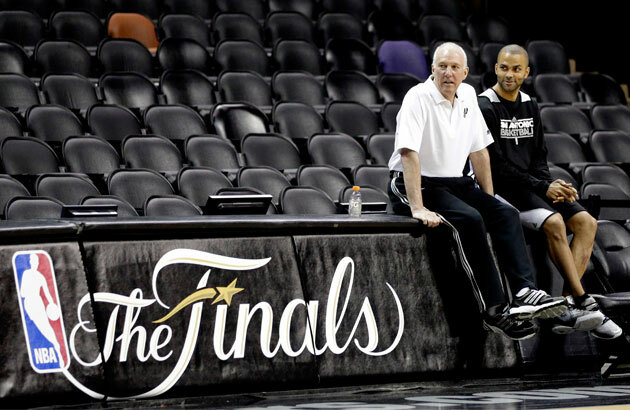 The Spurs are looking forward to the possibility of celebrating a fifth NBA championship. The questions are many entering this game. Can LeBron James come up with another big outing? Can his teammates provide enough support for a win? Can the "old men" of the Spurs, Tim Duncan, Tony Parker and Manu Ginobili (MAN'-oo jih-NOH'-blee), muster enough will power to earn another title? It all begins tonight at 6 p.m. pacific time. (AP) — David Murphy had three hits and scored twice to snap out of a long slump, and the Texas Rangers beat the AL West-leading Oakland Athletics 9-4 on Wednesday night. Justin Grimm (6-5) trailed when he threw his last pitch, but the Rangers scored twice in the bottom of the fifth to go ahead and make him the first Texas starter this month to get a victory. Rangers starters had gone 17 consecutive games without a win since Derek Holland beat Kansas City on May 31. The team's previous longest such stretch was 16 in a row in 1975. Ian Kinsler had a sacrifice fly off Tommy Milone (6-7) that tied the game in the fifth before Leonys Martin raced home on a grounder with the go-ahead run. (AP) — Gregor Blanco had a pinch hit, two-run triple in the seventh inning, leading the San Francisco Giants to a 4-2 victory over the San Diego Padres on Wednesday. Brandon Belt and Marco Scutaro also drove in runs as the Giants won their second straight following a three-game slide. Scutaro and Hunter Pence each had two hits. Will Venable and Jesus Guzman each hit home runs for the Padres, who have lost two straight after a seven-game winning streak. Madison Bumgarner (7-4) won his third straight start after allowing two runs on three hits over seven innings. He walked four and struck out eight. Padres starter Eric Stults gave up two runs on seven hits over 6 1-3 innings. He walked two and struck out three. Luke Gregerson (4-3) did not retire a batter, giving up two runs on four hits. He took over for Stults after Tony Abreu singled with one. 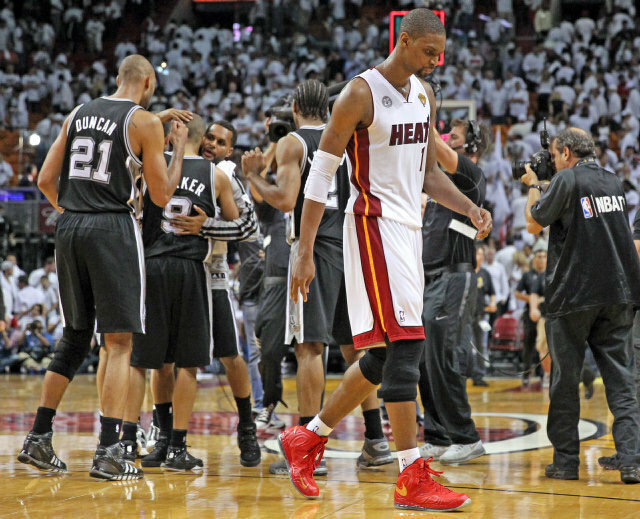 (AP) — The San Antonio Spurs just couldn't put away the Miami Heat. The Spurs led by 13 with 3:50 left in the third quarter, by five with 28.2 seconds remaining in regulation and by three with 2:42 to play. But the Heat managed to force a seventh game in the NBA Finals by scoring the last six points to beat San Antonio 103-100 in overtime. Allen forced overtime by draining his three with 5.2 seconds left following a huge offensive rebound by Chris Bosh. Mario Chalmers scored 14 of his 20 points in the first half, and Dwyane (dwayn) Wade finished with 14 points. Tim Duncan scored 25 of his 30 points in the first half to help the Spurs take a 50-44 lead into intermission. But he failed to score after converting a three-point play that put San Antonio ahead 68-56 with 4:31 left in the third quarter. Game 7 is Thursday in Miami. (AP) — Juan Perez hit a tiebreaking single with two outs in the eighth inning and the San Francisco Giants beat San Diego 5-4 on Tuesday night, snapping the Padres' seven-game winning streak. Buster Posey started the San Francisco comeback with a leadoff single. After Hunter Pence struck out, Brandon Belt doubled in pinch runner Andres Torres. Nick Noonan was intentionally walked and Joaquin Arias lined out to center before Perez rolled a single just past second baseman Logan Forsythe for the go-ahead score. Belt finished with three hits to help the Giants move into a second-place tie with Colorado in the NL West. 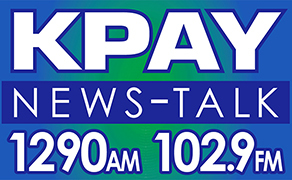 (AP) — Brandon Moss and John Jaso homered off Yu Darvish and the AL West-leading Oakland Athletics beat Texas 6-2 on Tuesday night. Jarrod Parker (6-6) limited the Rangers to two runs and three hits over seven innings to improve to 4-0 his last five starts. Darvish (7-3) struck out 10, increasing his majors-best total to 137, but still hasn't won in more than a month. The ace from Japan is 0-2 in his last six starts, a stretch that began with a 1-0 loss to the Athletics on May 21, five days after his last win. Moss put the A's ahead to stay when his 13th homer led off the second. Jaso led off the next inning with his third homer and a 3-0 lead. 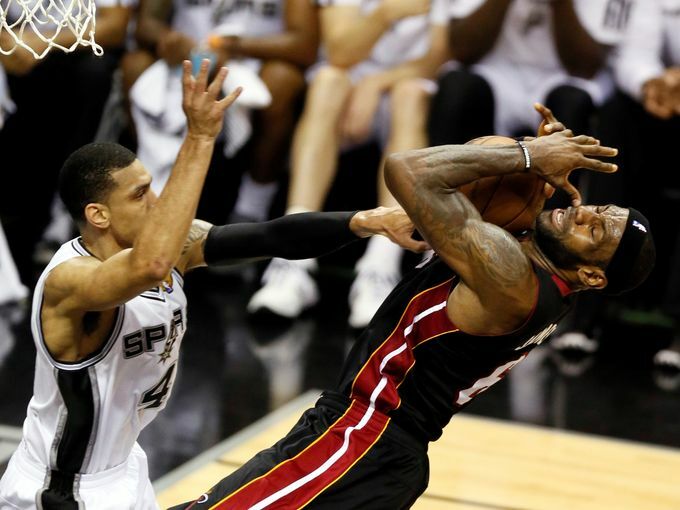 (AP) — The San Antonio Spurs will attempt to finish off the NBA Finals and the Miami Heat this evening when the two teams square off in Miami. The Spurs took a 3-2 lead in the best-of-seven series with a 114-104 win Sunday night. If Miami wins tonight's outing, the seventh and final game will be played in Miami Thursday night. A key to the game may be how Miami plays defense on Danny Green. He has become the most feared sharpshooter in the series, having already set a Finals record with 25 3-pointers. And based on past performances, with the season on the line, it is a good beet LeBron James will come out and provide some big-time heroics for the Heat. 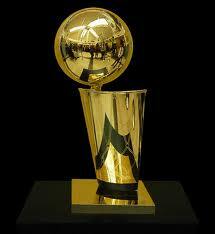 Should the Spurs win tonight's game, or Thursday's for that matter, they will have their fifth NBA championship. (AP) — Will Venable made an incredible catch to save San Diego, pinch-hitting pitcher Andrew Cashner drove in the go-ahead run with a perfectly executed safety squeeze in the 13th inning, and the Padres extended their season-best winning streak to seven games with a 5-3 victory over the San Francisco Giants on Monday night. 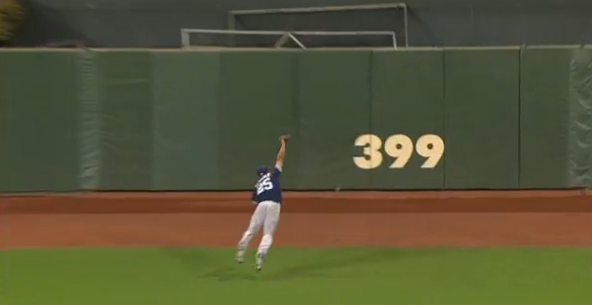 Venable's diving grab on the center-field warning track with his back to home plate ended the 12th and stole a game-winning hit from Juan Perez. Moments later, Alexi Amarista started the winning rally with a single and went to third on Chris Denorfia's single. Cashner came up to face Jose Mijares (0-1) and dropped down a bunt single between the mound and third base for his sixth career hit and second RBI. San Diego added another run on a bases-loaded walk from Jake Dunning. (AP) — Nelson Cruz homered twice, A.J. Pierzynski drove in three runs and the Texas Rangers snapped a six-game losing streak with an 8-7 win over the AL West-leading Oakland Athletics on Monday night. The Rangers totaled only eight runs during what was the longest active skid in the majors. Cruz's second homer was a two-run shot off Jesse Chavez (1-1) on an 0-2 pitch in the fifth inning to put Texas up 7-6. It came right after Pierzynski's RBI double. Pierzynksi also homered. Cruz added a double in the seventh to match a season high with four RBIs. Oakland wiped out an early 3-0 deficit with a six-run fourth off rookie Nick Tepesch. Neal Cotts (3-1) went 2 1-3 innings in relief. Joe Nathan allowed a run in the ninth before earning his 21st save. (AP) — Daniel Paille (PY'-ay) entered the Stanley Cup Finals with just two goals in 16 postseasons games. He's managed to double that total by netting the game-winner in each of the last two contests to help the Boston Bruins take a two-games-to-one lead over the Chicago Blackhawks. Patrice Bergeron (BEHR'-zur-ahn) doubled the Bruins' lead with 5:55 left in the period. Rask posted his third shutout of the playoffs and lowered his goals-against average in the finals to 1.22. Bryan Bickell nearly ended the shutout bid, beating Rask but hitting the right post with 42 seconds left. The Blackhawks played without forward Marian Hossa (HOH'-sah), who was scratched after being hit by a puck during warm-ups. Game 4 is Wednesday night in Boston. (AP) — Today's schedule of play in the College World Series opens up this afternoon with North Carolina playing LSU. The Tar Heels lost their first game to North Carolina State, while LSU was beaten by UCLA. In tonight's game, the Bruins of UCLA are playing the N.C. State Wolfpack. The Chico Nuts made it happy day for their dads with an 8-2 over the Sacramento Stingers on the final day of the American Legion Father's Day Baseball Tournament. As reported by the Chico-ER, Clayton Schuler drove in three runs and Andrew Shippelhoute tossed a complete game in the win. (AP) — Freddie Freeman singled three times and drove in one run, Julio Teheran pitched six scoreless innings and the Atlanta Braves beat the San Francisco Giants 3-0 on Sunday night. Teheran (5-3) allowed seven hits and one walk. The 22-year-old struck out eight and benefited from stellar plays by outfielders Jason Heyward and Justin Upton in the fourth, and by Andrelton Simmons at shortstop in the sixth that kept a run from scoring with the Braves holding a two-run lead. Lincecum (4-7) gave up six hits and five walks in six innings. Two of his three runs were earned, and he struck out three. Braves closer Craig Kimbrel pitched a scoreless ninth to earn his 19th save in 22 chances. Kimbrel struck out Andres Torres and Joaquin Arias before retiring Nick Noonan on a flyout. 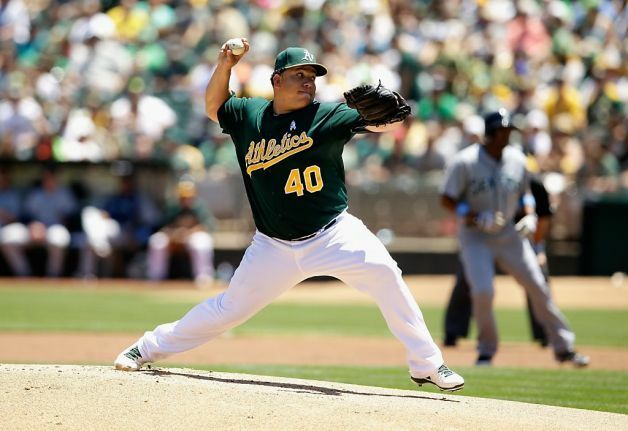 (AP) — Bartolo Colon worked seven strong innings to win his sixth straight decision, Josh Reddick homered and matched a career high with four hits, and the Oakland Athletics avoided a sweep with a 10-2 victory over the Seattle Mariners on Sunday. Yoenis Cespedes, Coco Crisp and John Jaso each drove in runs for Oakland. Colon (9-2) allowed two runs on eight hits, did not walk a batter and struck out three to extend his home win streak to seven. (AP) — If the Miami Heat are to win a second straight NBA championship, they'll need to win the last two games of their season. 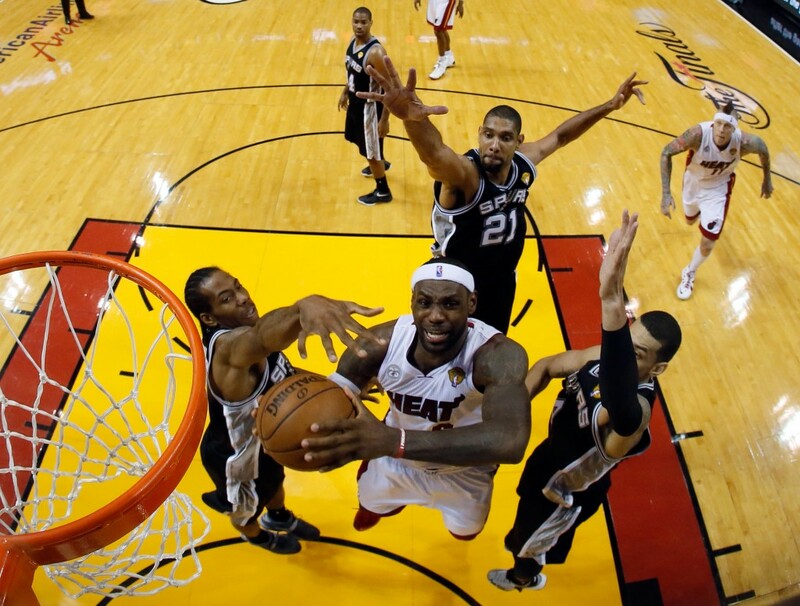 The San Antonio Spurs have grabbed a 3-2 lead in the Finals by downing the Heat 114-104. Tony Parker was outstanding while playing through a strained right hamstring, finishing with 26 points on 10-of-14 shooting. Manu Ginobili (MAN'-oo zhih-NOH'-blee) had his finest game of the series, shooting 8-for-14 and finishing with 24 points and 10 assists. And Danny Green continued his three-point assault by hitting six of 10 from beyond the arc to finish with 24 points. Tim Duncan chipped in 17 points and 12 rebounds for the Spurs, who shot 60 percent from the floor while holding Miami to 43 percent. Ray Allen tried to keep the Heat close, going 4-for-4 from three-point range and contributing 21 points. Dwyane (dwayn) Wade and LeBron James each had a team-high 25 points for Miami but shot a combined 18-for-44. Of the 27 previous times the series was tied at 2-2, the Game 5 winner went on to win 20 of them. The Spurs can wrap up their fifth championship Tuesday in Miami. (AP) — For the first time in 43 years the U.S. Open champion is an Englishman. Justin Rose claimed his first major championship by winning at Merion Golf Club, holding off Phil Mickelson and Jason Day. Rose closed with an even-par 70 for a 1-over total that made him the first Englishman to win the event since Tony Jacklin in 1970. The tournament took a turn in Rose's favor on 15, where Mickelson and Hunter Mahan lost shots to fall out of a tie for first. Rose tapped in for par on 18 to maintain the lead, then waited until Mickelson missed a long birdie try on the final hole. Mickelson bogeyed 18 for a 4-over 74 that left him tied for second with Day at plus-3. Mickelson carried a one-stroke lead into the final round before posting his sixth U.S. Open runner-up finish, extending his record. Rose's final round consisted of five birdies and five bogeys. He missed a 5-footer for par at No. 3, but he sank long birdies on the 6th and 7th, then moved ahead of Mickelson with a 20-footer at No. 13. Jason Dufner tied for the day's best round, carding a 67 to finish in a tie for fourth with Ernie Els, Billy Horschel and Hunter Mahan. Steve Stricker was in the hunt until his 76 left him five strokes back and tied with Luke Donald. Tiger Woods completed a forgettable US Open with a 4-over 74 to finish 13-over par. Shawn Stefani (STEH'-fan-ee) provided the shot of the day by acing the 299-yard 17th hole. He's the first golfer to make a hole-in-one in the five U.S. Opens held at Merion. (AP) — Matt Cain allowed two hits over 6 2-3 innings and the San Francisco Giants pounded the Pittsburgh Pirates 10-0 on Thursday night. A year to the day after throwing a perfect game against Houston, Cain (5-3) was nearly flawless again. He struck out three and walked two, giving up a single to Garrett Jones in the fifth and a double to Andrew McCutchen in the seventh. Hunter Pence hit his 11th homer of the season, while Buster Posey, Gregor Blanco and Joaquin Arias had three hits apiece for San Francisco, which avoided a sweep by spoiling Charlie Morton's return from Tommy John surgery. Morton (0-1) surrendered four runs on seven hits, striking out five and walking one. The right-hander also hit three batters while making his first major league start in more than a year. (AP) — Nate Freiman singled home the winning run in the 18th inning against Mariano Rivera, lifting the Oakland Athletics to a 3-2 victory over the New York Yankees on Thursday for a three-game sweep. 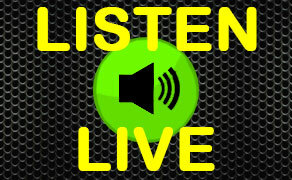 John Jaso singled off Preston Claiborne (0-1) to start the rally. Freiman ended the 5-hour, 35-minute game on New York's getaway day to Anaheim for a weekend series with the Angels. A day game after a night game turned into a night game after a day game. Moments before, Rivera issued just the 39th intentional walk of his 19-year career to Jed Lowrie. Oakland became the first American League team to play two 18-inning games in one season since the A's and Washington did so in 1971. (AP) — The biggest adjustment for Dwyane Wade came hours before Game 4 of the NBA Finals. It was when Miami coach Erik Spoelstra made the decision to start Mike Miller over Udonis Haslem, with the thinking that it would help thwart San Antonio's defensive schemes against LeBron James. Instead, it served as a time machine of sorts for Wade — who found his form again, on a night when the Heat absolutely needed it most. The Finals are now a best-of-three series that will be decided next week in Miami, thanks largely to Wade, who came up with his best game in months to carry the Heat in Game 4 on Thursday night. He had 32 points,six rebounds, six steals and four assists, and the Heat shook off an early 10-point deficit to beat the Spurs 109-93 on Thursday night. The series is knotted at two games apiece, with Game 5 in San Antonio on Sunday. (AP) — Spurs guard Tony Parker will play in Game 4 of the NBA Finals after his availability was in doubt because of a mild right hamstring strain. Parker wouldn't address his injury at practice Thursday other than saying he was "ready to go." The All-Star was hurt early in the second half of Game 3, which the Spurs won to take a 2-1 lead over the Miami Heat in the best-of-seven series. Parker is averaging 13.3 points and 6.3 assists in the Finals. Spurs guard Gary Neal says it's a "huge brick off our shoulders" that Parker was cleared to play. (AP) — Thunder, lightning and heavy downpours have settled in over the Merion Golf Club outside Philadelphia, suspending first-round play at the U.S. Open. U.S. Golf Association officials called a halt to play at 8:36 Eastern, just short of two hours after the opening shot of the tournament was struck. Thunderstorms with possible severe weather are forecast throughout the day, casting doubt on whether the first round will be completed. The Merion Golf Club course was drenched by six and a half inches of rain over the weekend and into the early portion of this week. Among those who got in some play before the skies opened is five-time US Open runner-up Phil Mickelson. He left earlier this week to fly to San Diego, where his daughter Amanda graduated from the eighth grade yesterday. Mickelson then took a late flight back last night and made it in time for his 7:11 tee time. 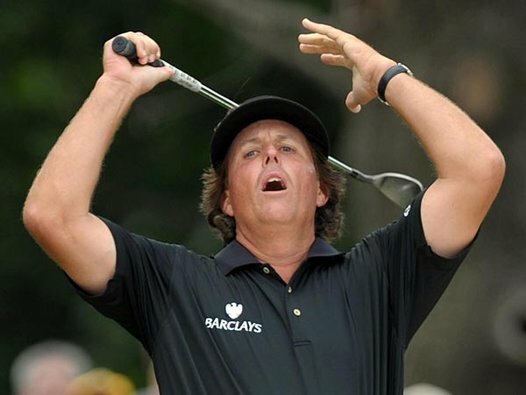 Mickelson is even par through five holes. The rain short-circuited a blazing start by Ian Poulter, who shot to the top of the leader board by making birdies on his first three holes. No. 1-ranked Tiger Woods is set to play in a group with second-ranked Rory McIlroy and No. 3 Adam Scott for the first two days. Woods enters the tournament with four wins this year. He's trying to snap a five-year winning drought at major championships. 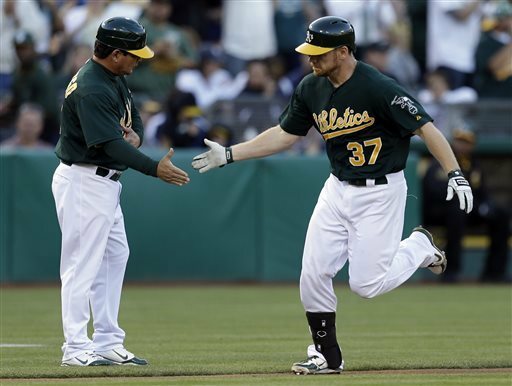 AP) — Brandon Moss hit a two-run homer and a solo shot for his third career two-homer game, and the Oakland Athletics beat the New York Yankees 5-2 on Wednesday night. Moss' power stroke helped Dan Straily (4-2) win his third straight decision. Moss hit his 10th homer in the second inning and 11th with a solo drive in the eighth. He also connected twice April 29 against the Angels. Of his five hits over 40 at-bats in his last 19 games, all are home runs. John Jaso added an RBI double and a run-scoring single in Oakland's 10th consecutive home victory. The A's (40-27) won for the 20th time in 25 games and are off to their best start since 1990. The A's go for the series sweep this afternoon in Oakland. (AP) — Starling Marte had a career-high four hits and scored four times and the Pittsburgh Pirates beat the San Francisco Giants 12-8 on Wednesday night. Neil Walker and Alex Presley homered for Pittsburgh. Jordy Mercer, Andrew McCutchen and Gaby Sanchez had three hits each as the Pirates set season highs for both runs and hits. Francisco Liriano (5-2) survived six erratic innings to pick up the win. Joaquin Arias knocked in three runs for the Giants and Hunter Pence doubled twice but San Francisco continued to struggle on the road. The defending World Series champions have lost 12 of 16 away from home. Barry Zito (4-5) allowed eight runs and 11 hits in 4 2-3 innings as his ERA on the road ballooned to 11.28. (AP) — Gerrit Cole took a shutout into the seventh inning of his major league debut and hit a two-run single in his first at-bat Tuesday night, leading the Pittsburgh Pirates to an 8-2 victory in front of a festive crowd. The top pick in the 2011 draft, Cole allowed two runs and seven hits in 6 1-3 innings after being called up from Triple-A Indianapolis earlier in the day. He began his highly touted career with a three-pitch strikeout — all 96-mph fastballs — of Gregor Blanco and struck out two overall. He did not walk a batter. Pedro Alvarez went 3 for 3 with a home run to back Cole. Starling Marte also homered and Andrew McCutchen and Russell Martin had two hits each. The Giants got some bad news as Pablo Sandoval was put on the disabled list with a hairline fracture in his foot. Also, Marco Scutaro was hit on the pinkie with a pitch in Tuesday night's game. 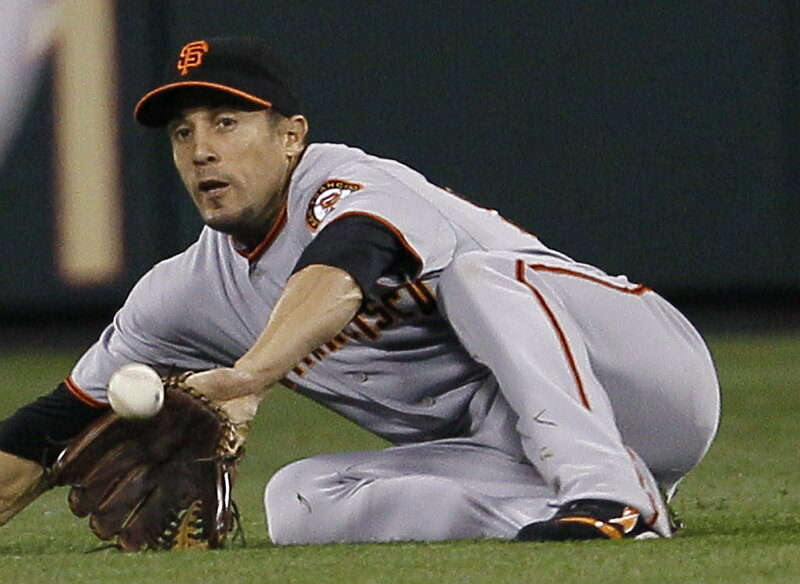 X-ray's were negative but training staff fears Scutaro may have ligament damage. He will not play in today's game. (AP) — Derek Norris homered and drove in four runs and Bartolo Colon pitched six scoreless innings to lead the Oakland Athletics to a 6-4 victory over the New York Yankees on Tuesday night. Coco Crisp led off the game for Oakland with a homer off CC Sabathia (6-5) before Norris and Colon (8-2) took over to lead the A's to their eighth win in 11 games. Sabathia allowed six runs and eight hits in six innings in his homecoming start in front of many fans that came from his hometown of nearby Vallejo to watch him pitch. The A's did get some bad news when star outfielder Yoenis Cespedes had to leave the game after the second inning with tightness in his left hamstring. He is day to day. Cespedes appeared to hurt himself running out a groundout in the first inning. 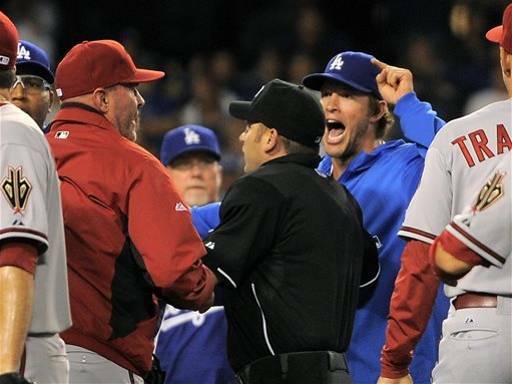 (AP) — Ian Kennedy hit Yasiel Puig and Zack Greinke with high pitches, sparking a heated brawl that involved players and coaches and resulted in six ejections in a game in which the Los Angeles Dodgers rallied to beat the Arizona Diamondbacks 5-3 Tuesday night. 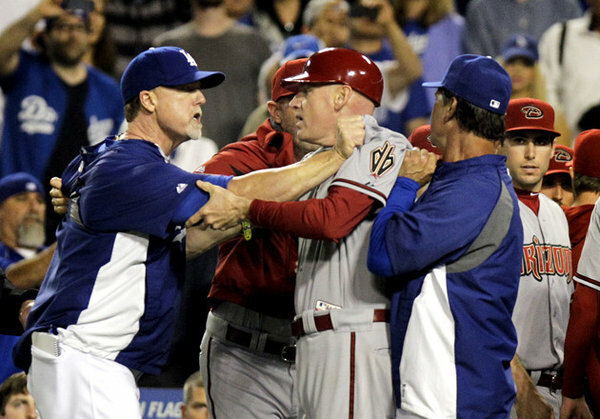 Kennedy, Diamondbacks manager Kirk Gibson and coach Turner Ward, along with Puig, reliever Ronald Belisario and Dodgers hitting coach Mark McGwire were ejected in the seventh inning after the prolonged scuffle that nearly spilled into the stands. 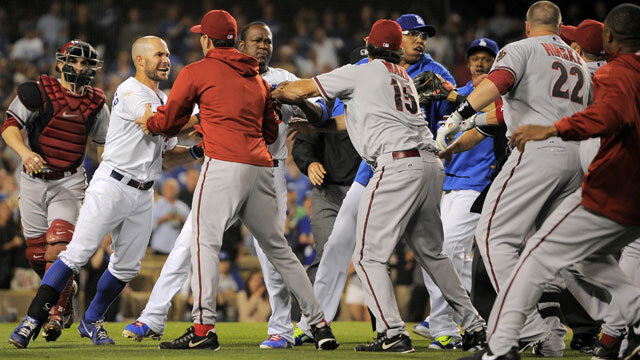 In the top of the seventh, Greinke hit Diamondbacks catcher Miguel Montero in the back and both teams came charging onto the field, but the scrum broke up quickly with no punches thrown. That was payback for Kennedy hitting Puig in bottom of the sixth — the ball deflected off Puig's shoulder clipped his nose. The four-time NBA Champion San Antonio Spurs are in South Beach to take on the Miami Heat in Game 1 of the NBA Finals tonight. The Spurs weaved their way thru the Western Conference playoffs to make it to their fith finals in the Tim Duncan era. 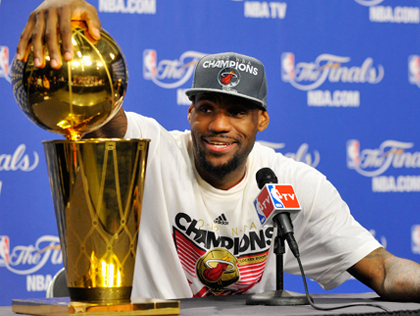 For the Heat it is the third straight time playing for an NBA title and the stakes couldn't be higher. For LeBron James, Dwayne Wade and Chris Bosh it marks there best chance to cement themselves as one of the penultimate teams in NBA history. A loss in this finals and they will be considered an aging group that rode James coat-tails only to come up short, twice, when it most mattered. Games 1 & 2 will be played in Miami and then the series shifts to San Antonio for Games 3 & 4 and if necessary Game 5. (AP) — Major League Baseball is interviewing players linked to a Miami anti-aging clinic that allegedly sold performance-enhancing drugs and has become the focus of the sport's investigation. According to numerous reports, clinic founder Anthony Bosch has agreed to talk with MLB investigators. Players union head Michael Weiner says the commissioner's office has assured the union that "no decisions regarding discipline have been made or will be made until those interviews are completed." "It would be unfortunate if anyone prejudged those investigations," Weiner said in a statement. 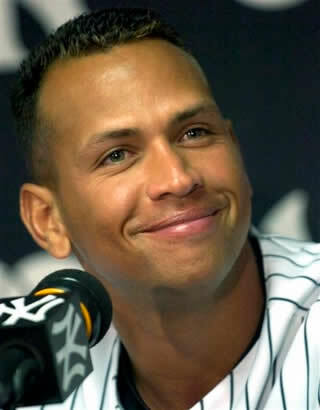 Alex Rodriguez, Ryan Braun, Nelson Cruz, Melky Cabrera and Bartolo Colon (bar-TOH'-loh koh-LOHN') are among more than a dozen players whose names have been tied to the now-closed clinic. The A's let a 3-0 8th inning lead slip away in Milwaukee last night as the usally reliable Athletics bullpen struggled. Yuniesky Betancourt's RBI double on the 10th inning was the game-winner as the Brewers beat Oakland 4-3. Oakland's Bartolo Colon (bar-TOH'-loh koh-LOHN') goes for his seventh victory when the A's visit Milwaukee to play the last-place Brewers in a day game at Miller Park. Tim Lincecum was the Lincecum of old and Andres Torres second inning home run held up as the Giants beat the Blue Jays 2-1 at AT & T Park on Tuesday night. Toronto sends out 4-7 R.A. Dickey against San Francisco in a day game at AT&T Park. Barry Zito (ZEE'-toh) gets the nod for the Giants, who start the day two back of Arizona in the NL West. (AP) — The Indiana Pacers say they've been ignored most of the season and really belong as one of the elite teams in the NBA. Tonight in Miami, the Pacers can prove that point with a victory over the defending NBA champion Miami Heat in Game 7 of the Eastern Conference finals. The Pacers forced the showdown game with a thorough 91-77 beat-down of the Heat Saturday night in Indianapolis. Paul George poured in a career playoff-high 28 points while grabbing eight rebounds and dishing out five assists. Roy Hibbert was a force in the middle at both ends of the court with 24 points and 11 rebounds. Afterward, Hibbert detracted from his own performance with some crude post-game comments. The NBA fined Roy Hibbert $75,000 for using a gay slur and cursing during his news conference after Game 6. Hibbert issued a statement apologizing for his remarks, saying they were disrespectful, offensive and not a reflection of his personal views. Commissioner David Stern said that while Hibbert's apology is sincere, he fined him anyway. If the Heat are to reach the NBA Finals for the third straight year, LeBron James will need some scoring help. He had 29 points Saturday night. But Chris Bosh added only five and Dwyane (dwayn) Wade had 10 in the loss. Bosh and Wade were a combined 6 of 19 from the field. (AP) — The Sacramento Kings have confirmed that Mike Malone will be their new coach and he will be introduced at a news conference today. Malone is the son of former NBA coach Brendan Malone and has been an assistant in the league for more than a decade. The younger Malone replaces Keith Smart, who was fired Friday. (AP) — Chad Gaudin picked up a win in his first start in over three years and Brandon Belt broke a tie with a two-run pinch-hit double to lead San Francisco to a 4-2 win over the St. Louis Cardinals on Sunday, ending the Giants' seven-game road skid. Gaudin (1-1) went six innings in his first start since Sept. 28, 2009 as a member of the New York Yankees. He allowed four hits and two runs, both coming on a two-run homer by David Freese in the fourth. Gaudin is temporarily replacing Ryan Vogelsong in the rotation. 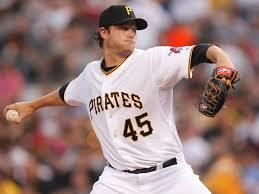 Vogelsong broke several bones in his right hand May 20. Belt slammed the first pitch from reliever Randy Choate into the gap in left-center to bring in Brandon Crawford and Gregor Blanco for a 4-2 lead in the seventh inning. Crawford began the rally with a single off St. Louis rookie Tyler Lyons (2-1). Josh Donaldson's sixth-inning sacrifice fly ended a career-best 28-inning scoreless streak by Chicago starter Chris Sale, and the Oakland Athletics beat the White Sox 2-0 on Sunday for a weekend sweep. Jarrod Parker (4-6) hung tough in an impressive pitcher's duel with Sale to win back-to-back starts for the first time this year. The right-hander matched his season high with seven strikeouts in 6 1-3 innings as Oakland won for the ninth time in 11 games. Sale (5-3) lost for the first time in six starts since an April 18 defeat at Toronto. The White Sox (24-30) lost their season-high sixth in a row and matched a season-worst by falling to six games below .500.